The Great Barrier Reef is the world’s largest coral reef system composed of over 2,900 individual reefs and 900 islands stretching for over 2,600 kilometres over an area of approximately 344,400 square kilometres.The reef is located in the Coral Sea, off the coast of Queenslandin north-east Australia. 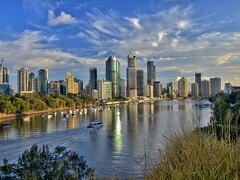 Win a trip to Queensland, Australia to attend the 6th Asia Pacific Triennial of Contemporary Art. The Asia Pacific Triennial (APT) is the most important contemporary art event in the Asia-Pacific and this year’s edition will feature more than 100 artists and filmmakers from over 25 countries across the region. To enter simply complete the entry form, answer the question, and you could be on your way to one of the world’s most exciting art events. The winner must be able to travel to Brisbane for the APT6 opening on 5 December 2009. The winner must also submit an article about the exhibition and their experience in Brisbane. Entries close 5pm, Tuesday, 10 November 2009.